Five of my favourite debut novels! I’ve been watching booktube for a little while and when I went on youtube today my feed was filled with “top 5 Wednesday” videos. (The situation being every Wednesday, there’s a topic and you choose 5 of that topic!). The goodreads group is here if you’re interested and here is Lainey, the creator’s, channel too! First up we have City of Bones by Cassandra Clare, the first in The Mortal Instruments series. This was one of the first books that got me back into reading in 2012! Cassandra Clare is a very talented author and I’ve found, from reading the rest of The Mortal Instruments and The Infernal Devices, that her writing improves every time and I cannot wait for the next installments in The Shadowhunter Chronicles. 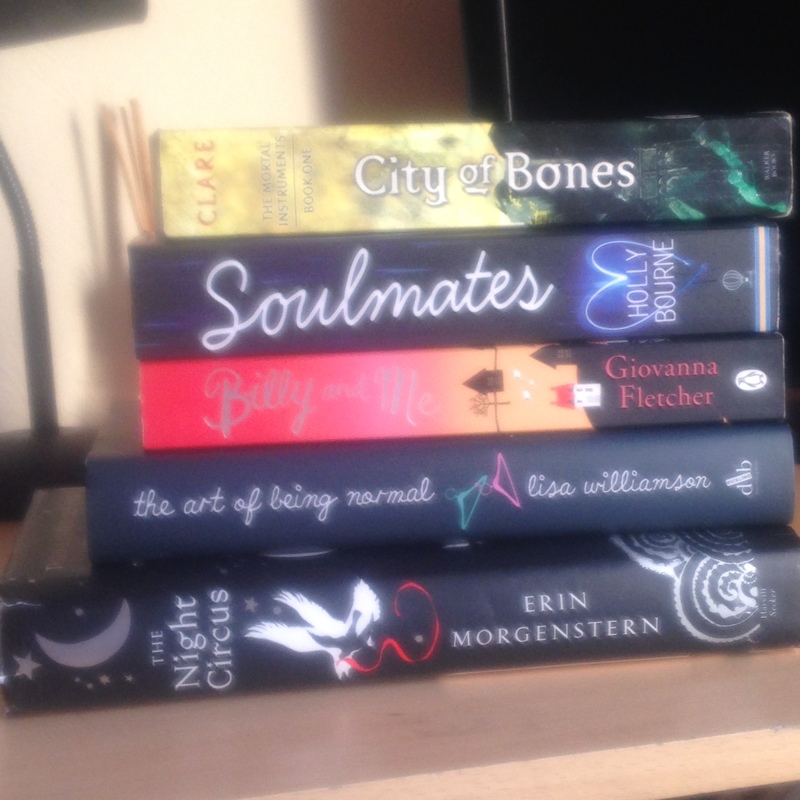 Soulmates by Holly Bourne is one of my favourite contemporaries! A brilliant and original take on a typically cliché plot! I did a full review here! Billy & Me by Giovanna Fletcher is a beautiful romantic novel about a girl being thrown into the world of fame as she begins dating a famous actor. I was very impressed with Giovanna’s writing and the relationship between the main characters. Shame I didn’t feel the same about her second novel. But I did like the Christmas theme novella Giovanna released as a tiny companion to Billy & Me. The Art of Being Normal by Lisa Williamson is a beautiful YA contemporary following trans kids! Yeah, you heard me, MAIN CHARACTERS THAT ARE TRANSGENDER! Fish out of water, right? This is absolutely fantastic. A little bit repetitive within the middle but a very impressive debut novel. The Night Circus by Erin Morgenstern, like City of Bones, was one of the first books that got me back into reading. It’s a fantastic fantasy book with the most incredible world building, it’s one of those books that is so captivating and because of that it’s one of my all time favourite books! Hope you enjoyed! Sorry if the picture was a bit too bright haha. Hope you’ve discovered some new books too!